We know the ferry from Ancona has arrived at Split, Croatia, because a passionate Italian is hammering on the cabin door shouting “get up you lazy buggers”. The lady in the bunk above me – on her way to visit her husband in Dubrovnik who is working with a shipping firm there – curses in her best Italian and instantly appears fully clothed at the door with her lipstick on. Overnight, Loretta and I have become firm friends, having discussed the problems of long-distance relationships, the complexity of married partners working in different countries, the frustrations of existing as a single mother – in her opinion making her “a super mama” – and the pleasure of being able to show the beauty of Croatia to her three children. Continuing to reflect on the double-edged sword of the ease with which we travel and work between various European countries, Loretta and I tumble into the disorder of huddled passengers shovelling themselves onto the deck, blinking themselves awake, and failing to walk off the boat in to the port because they’ve suddenly noticed that it’s raining. The tourists check themselves. 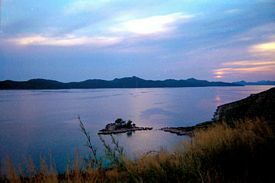 This is the Dalmatian coast after all, with its archipelago of idyllic islands (the largest in the Mediterranean), and in the middle of August – so all the sacred guidebooks say – it’s supposed to be blissfully sunny. A Mexican wave of waterproofs erupts and as if following a helpful usher, everybody shuffles off to the cafe glowing in the distance to digest their thoughts over a cup of café, cappuccino or kava – depending on their now confused linguistic orientation. I have two words in my foggy head: private rooms. At 600 Kuna plus a night, and despite the very favourable exchange rate (7.3 K to a Euro), it’s clear that hotels are out of my league. As if in direct response to my mental meanderings, a man in a bright red and orange tropical shirt suddenly appears, introduces himself as Mario, and says his sister Yela has a cheap room for 120 Kuna a night. As we walk in happy union under his umbrella along the palm tree-strewn promenade, shards of light break through the clouds, instantly turning the view over the pretty port into a post-card quality scene. Mario beams and the significance of his shirt becomes clear as he boasts, “Look! You are in Hawaii!”. By the time we have darted along the winding cobbled streets to Yela’s place, the sun has come out and Mario has filled me in extensively in fluent AngloDeustch on where to buy cheap cigarettes from Bosnia (100 K for a pack of ten), how to get to the island of Brac and its aquamarine waters (one hour away by boat), the best place to go for dinner (he will take me to a good place for fresh sardines at eight o’clock), the situation with the weather (very changeable at the moment), and the political situation in Croatia (although the country is no longer at war and the situation is stable, I should avoid places laced with unexploded land-mines around Dubrovnik). Asking about the war is not considered offensive. Normally deeply suspicious to the point of paranoia of anybody directing my course of action to this extent, I find that I instantly warm to Mario and Yela, who fusses around me in her kitchen making coffee and smiling like a happy grandmother fattening up her loved ones, pushing fresh figs, plums, apricots and sweet pastries in my direction. Mozart floats through the window from the shop downstairs, church bells ring in the distance, and a young boy shouts repetitively, “Bruno!”. Mario talks in serious tones about the quality of material for trousers in England compared to Italy (far superior) compared to the quality of food in Italy compared to England (a subject instantly dismissed by a brief wave of his hand in the air, as discussion is clearly unnecessary). He concludes that Split has a perfect mixture of pasta and seafood, but not good trousers, and proceeds to argue with Yela about something to do with the fridge. I deduce from my rough translation and their various gesticulations that I will be staying in the dining room (which has a beautiful parquet floor and an imposing two foot painting of Christ), while Yela has given up her bedroom for an Italian couple, and has been sleeping for the last three weeks in the kitchen larder next to the fridge. Embarrassed by the domestic setup, I offer to move, but am argued down. “No, no, you are the guest,” says Mario, “Yela will sleep in my flat, and I will stay with my daughter”. The next morning, I notice the fridge has been moved to the hallway, and set off with a slighter easier conscience to explore Split and its surrounds. With its bronze beaches and Roman ruins, there is no denying that this stretch of Croatia’s coast is stunningly beautiful. Incredibly picturesque and dripping in history, Split features an impressive Diocletian palace-by-the-sea (entered on the UNESCO world heritage list in 1979), hidden in a labyrinth of paved alleyways. Croatia’s second largest city after Zagreb, and probably its most vital, it’s a big urban and university centre with some important collections of art and archaeological artefacts (including those at the Croatian Archaeological Monuments Museum). It also has easy access to some of the country’s most beautiful islands. The snow-tipped mountain ranges behind the town provide an impressive backdrop and the town’s best views. Split is considered to be a lucky city because it’s watched over not only by the mountains but also by a large pine-forested hill called Marjan, inhabited by gods who protected it in ancient times. Today, Marjan is Split’s largest and most attractive natural botanical park, where teenagers woo each other at night and the fashionable locals parade in their Sunday best. A short four-hour drive away from Split in a rented VW Polo (£30/day) is the legendary Dubrovnik. The road south is both deeply beautiful and amusing – a straight line down the coast, with a breath-taking view over the wide expanse of Adriatic Sea, it passes almost by accident through a miniature section of land belonging to Bosnia. Croatians claim this is the only country in the world where you have to pass through another country to get to one of their cities. The border guards look vaguely bored by the onslaught of traffic and locals returning almost as quickly as they left – “Hello! Goodbye! Hello!”. Dubrovnik is a must for anybody wanting to witness the rebirth of one of the world’s most beautiful medieval cities, subject to heavy shelling during the former Yugoslavian war (520 historic buildings damaged, 70% of roofs destroyed). The old city, also one of UNESCO’s world heritage sites, is jaw-droppingly beautiful and home to some architectural masterpieces and a summer festival with outdoor concerts in July/August. You can see why George Bernard Shaw described the city as “paradise on earth” when you pass through the old city walls (in parts up to 80 foot high and 20 foot thick) into the pedestrianised historic centre, with limestone streets worn down so much over the years that they now look like polished marble. With the help of £6 million of UNESCO funds, most of the buildings have been restored (the numerous new red terracotta roofs everywhere bear testimony to this). Sitting in one of the pavement cafes enjoying a plate of fresh mussels, it’s hard to believe that this ethereal place was the subject of Serb aerial attacks less than ten years ago. Dubrovnik is very much a cosmopolitan lived-in city, and arguably one of the prettiest towns in the Mediterranean. How to get there: Ferries leave to Split from Ancona, Italy, four times a day. The ten-hour trip costs 56 Euros (£37) for an overnight cabin space, 36 Euros (£24) for deck space during the day. 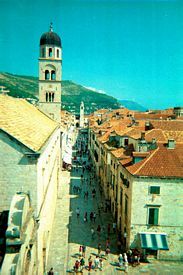 To drive to Dubrovnik to Split or vice versa, cars can be rented for around 350 K (47 Euros, £31) per day. Direct flights to Dubrovnik leave from Heathrow and Manchester in the UK, and no visas are needed for EU passport holders. Safety is good along this stretch of the coast and street crime is virtually unheard of. Lucia Appleby is a freelance writer and editor, and her most recent work has appeared in the Rough Guide to Mexico and on www.i-escape.com.